Switzerland, a country famous for its stable, private and secure banking system, is also a Crypto Powerhouse. In this privileged and unique business environment, a global cryptocurrency called the LAPO Coin (LAX) is being developed. It exhibits low volatility, high speed transactions and a solid level of privacy and security, features that make it the next generation coin. GENEVA, May 10, 2018	(Newswire.com) - The LAPO Coin is a cryptocurrency designed for real-world application. Unlike other Cryptos that are too volatile, too complex, or too slow, LAPO Coin has the right adaptive technology that will be integrated into real-world businesses. This means that everybody could use the LAPO Coin to buy different products or pay for various services, easily and quickly. The volatility of Bitcoin has made it extra helpful as a vehicle for hypothesis than as a forex, say critics — when the worth can change drastically from hour to hour, it introduces undesirable danger for sellers and patrons alike. Integrating a monetary policy is what LAPO Coin proposes to solve this problem. Stability creates a more favourable operating environment for economic activity, is important to developments in the real economy, and is the most valuable contribution that monetary policy can make to economic growth. For that reason, they are building an open source self-critical, intellectually honest, and adaptable Artificial Intelligence that can handle the monetary policy, they call it The Stability Fund. The LAPO Stability Fund is an Artificial Intelligence that analyse and calculate monetary policy and it is used to protect the coin against artificial price volatility. This completely autonomous Stability Fund can detect and avoid illegal market manipulation. Thanks to its Artificial Intelligence, it can analyse the market, social network news and historical data. This feature is then able to predict and understand, if and when, an illegal manipulation is taking place. Using Seigniorage Shares, the Stability Fund will be able to neutralize the threat and stabilize the market. LAPO Coin is a non-collateralized coin, and it is independent of all other currencies. Even if the US Dollar and Ether collapse, a non-collateralized coin like LAPO Coin could survive them as a stable store of value. Unlike the central banks of nation states, a non-collateralized stable coin would not have perverse incentives to inflate or deflate the currency. Its algorithm would only have one global mandate: stability and long-term growth. This is one of the best features of LAX to break the limits of today’s crypto-world. 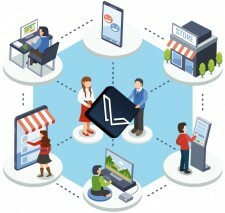 Simplicity along with the elegance of concept, easy integration points for partners and business, and the ability to work with an exchange, are some of the additional traits that will give LAPO a competitive advantage from the rest, and thus assist in the wider adoption of the LAPO Coin in the Cryptocurrency market. LAX has its own blockchain based on the DASH technology, and has improved this protocol by adding new features that include smart contracts, greater 2-tier network stability, and a faster block generation. The LAPO Coin is the first step of a bigger project: The LAPO ePlatform, a set of Financial Tools enabled by Blockchain innovation and powered by Artificial Intelligence. The ePlatform integrates a decentralized trading platform, an online (eGateway) and offline (Point of Sale) payment system, payment protection for commercial transactions, and as last step, the LAPO Bank. This will establish a secure and stable bridge to connect cryptofinance with the traditional financial industry and the LAPO Coin will be at its core. LAPO Coin will be used to provide liquidity to the platform and will be used in all transactions. LAX could also be used as collateral for loans. As the platform grows in popularity and use, the value of LAX should rise due to its limited supply based on the blockchain protocol. The LAPO ePlatform will also allow users to create their own unique tokens as a means of exchange. In the near future, the financial industry will be among the first parts of the economy most impacted by blockchain technology. The nature of the blockchain removes the need for brokers and intermediaries such as banks, and thus transactions will be much faster and cheaper, benefiting businesses and consumers alike. Moreover, the blockchain will provide added security given its immutable and decentralized nature, preventing the altering of the ledger and any single point of failure. By using the DASH technology with improvement features such as the ability to execute smart contracts, the LAPO Coin and its ePlatform are positioning themselves to become the leader in the financial industry. LAPO is the source of this content. Virtual currency is not legal tender, is not backed by the government, and accounts and value balances are not subject to consumer protections. Cryptocurrencies and tokens are extremely volatile. There is no guarantee of a stable value, or of any value at all. Token sales are only suitable for individuals with a high risk tolerance. Only participate in a token event with what you can afford to lose. This press release is for informational purposes only. The information does not constitute investment advice or an offer to invest.